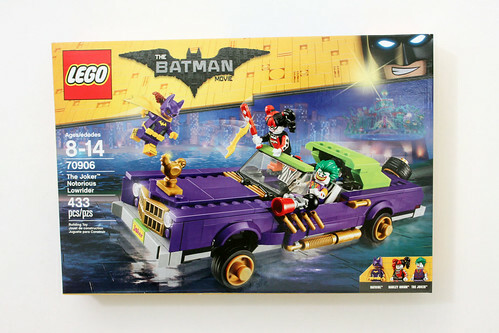 Some of The LEGO Batman Movie sets are now available in stores and online and one of those sets include The Joker Notorious Lowrider (70906) which was first revealed during San Diego Comic Con. 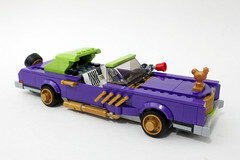 The set has 433 pieces and will retail for $49.99. 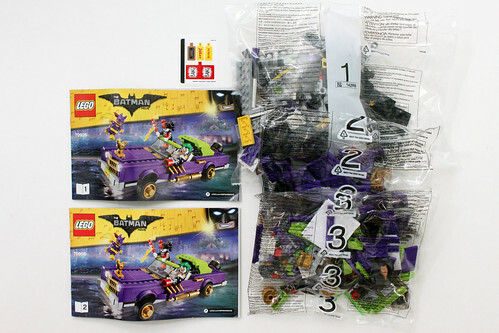 The contents of the box include three numbered bags and two instruction booklets. 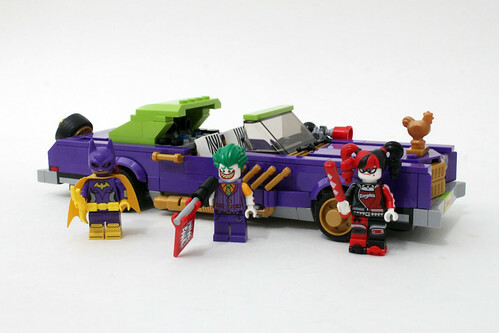 There are three minifigures in this set, Batgirl, the Joker, and Harley Quinn. The Joker is a far departure from the standard ones that we’ve gotten in the past. I believe this version of him is exclusive to this set. He wears a fancy purple striped vest with a short sleeve yellow shirt. You’ll also notice that both arms have tattoos of the suits of playing cards. The pants are also purple with some printing for the pockets. He has a double-sided head with a serious look with a tooth showing on one side and a large grin on the other. 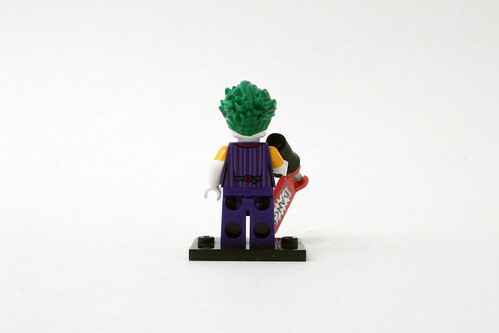 The green hair piece is new with a slicked back mold. 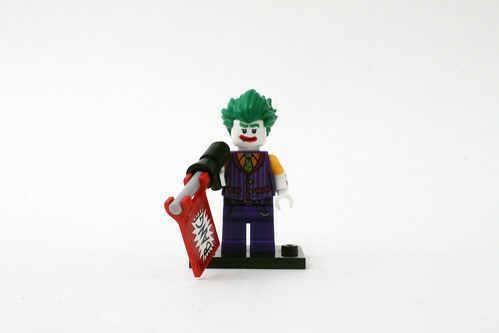 His accessory is a flag gun with the word “Bang!” on either side which are stickers. Harley Quinn is exclusive to this set and like the Joker, her design is vastly different to the previous Harley Quinn minifigures. For her torso, she has a red and black bowling jacket with a bomb and pin design on the back. Her inside shirt says “Smylex” which has no reference at this time. The arms has some printing of diamonds on one side and skulls on the other. The legs have some printing for the knee pads as well as some side printing. She has a double-sided head with a serious look on one side and happy on the other. 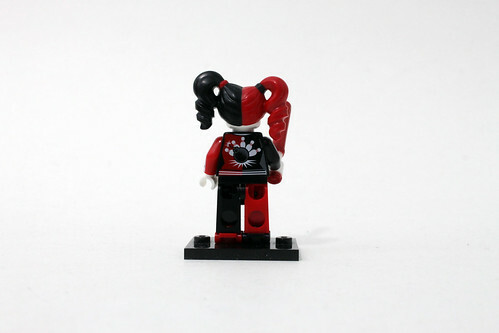 Her red and black hair piece is also a new mold and it looks very nice on her. 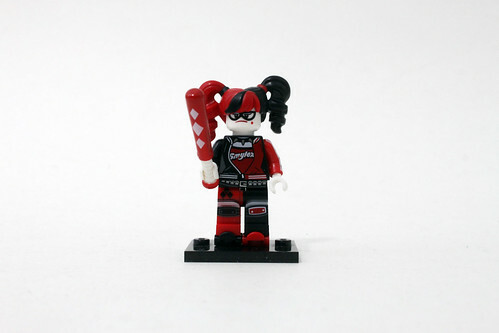 Harley’s accessory is a red bat with some white diamond printing. She also has some red and black roller skates. 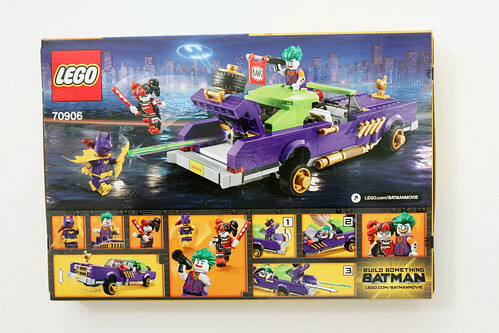 Finally, we have Batgirl who is also appears in the Catwoman Catcycle Chase (70902). 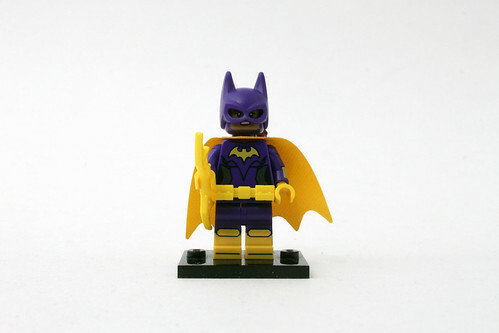 The whole Batgirl outfit is new with mostly purple and yellow. The legs are dual-printed with some side printing for the boots. 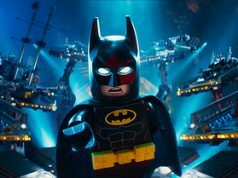 We get our first look at the new utility belt pieces for this line and probably for future uses. It just goes between the torso and the legs. She does have a double-sided head with normal expression on one side and an angry look on the other. 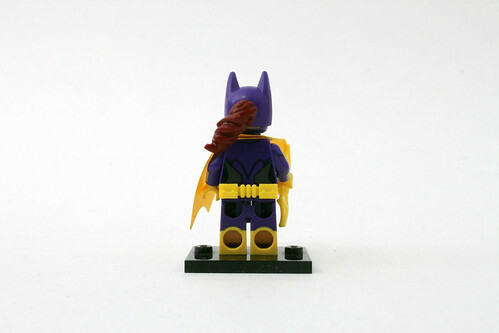 The cowl is new with a peg in the back for the hair. This allows the longer hair pieces to not pinch on the capes like they used to do. 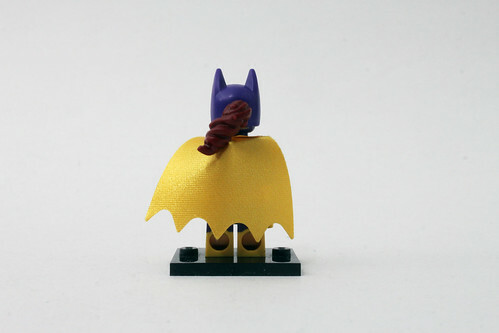 Speaking of capes, Batgirl has a new yellow cape that has sort of a light sheen on one side. 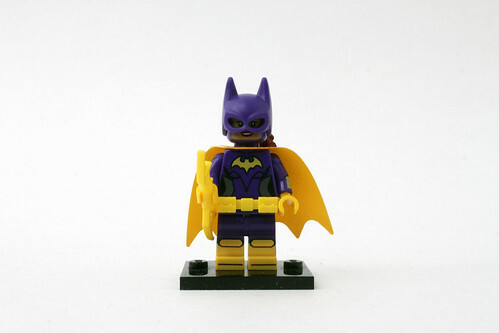 Lastly, her accessory is just your typical Batarang. 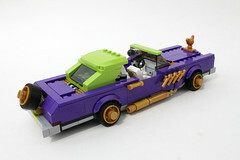 The only part of the build is the Joker’s Notorious Lowrider. 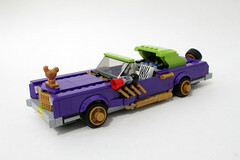 As you can see, it is a very pimped out vehicle, mostly likely of the Cadillac design. 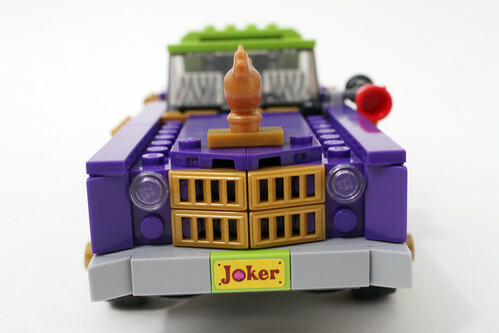 Starting from the front of the car, you have a nice looking pearl-gold grill with headlights along with the bumper with a stickered license plate that says “Joker”. Something funny about the hood ornament that I really like is that it is a pearl-gold chicken. I don’t know why but it’s random and it’s just one of the little funny details that we can expect to see in the movie. 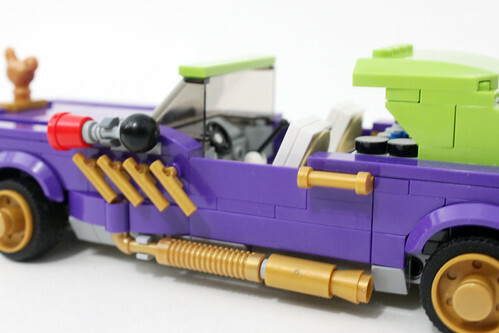 On the sides of the car, you have some pearl-gold exhausts running along the bottom of where the doors are. Above those are some pearl-gold nozzles to add to the overall look of the lowrider. On the driver side where the mirror should be is a squeeze horn which uses a bucket as the end piece. Behind the door areas are some handles for Batgirl to grab ahold on to. Inside the car, you have some very nice printed tiles for the seats which have some zebra print designs. 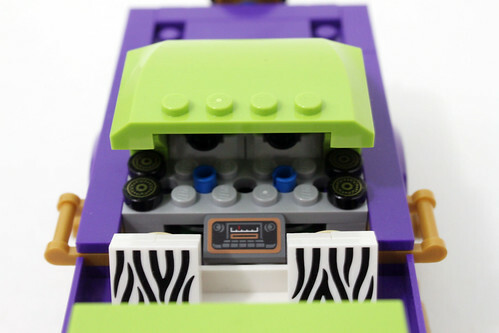 Behind the seats, there’s the stickered stereo system tile along with speakers in the back represented by 1×1 printed round tiles. You also have two blue Technic pins which has a play function that I’ll get to soon. 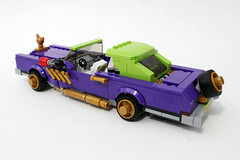 At the back of the lowrider, the trunk is able to open up to reveal two hidden spring-loaded missiles. Here you can press down on the Technic pins mentioned earlier to shoot them. 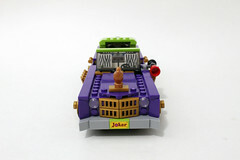 There’s also some trunk space to put in the Joker and Harley’s accessories. 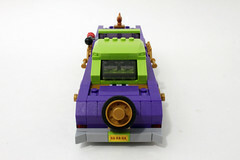 Finally, you have a spare wheel attached to the back as well. 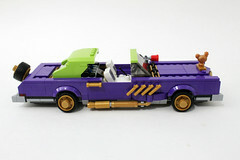 As for the main play feature of The Joker Notorious Lowrider, you have some rubberbands attached near the wheel axles. 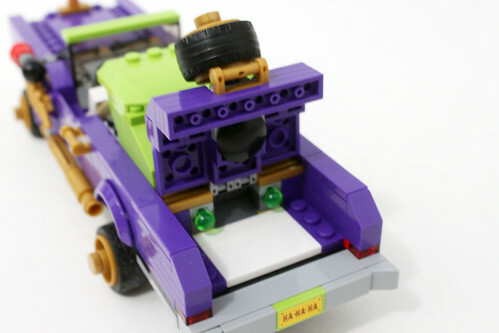 The reason for this is they let the Technic beams act like hydralic suspension to lift and lower the wheels. 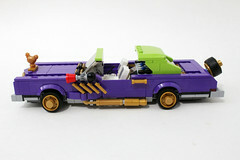 I really enjoy this feature as the lowrider can be situated in various positions. 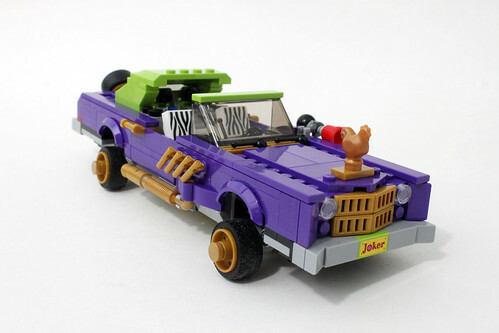 At the end of the day, The Joker Notorious Lowrider (70906) is a pretty nice set. 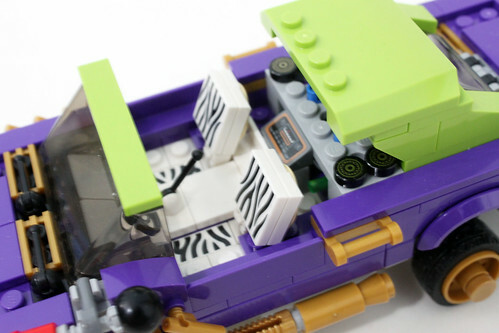 There’s lots of little details throughout that I liked such as the zebra tiles for the seats, the chicken hood ornament, and the suspension play feature. 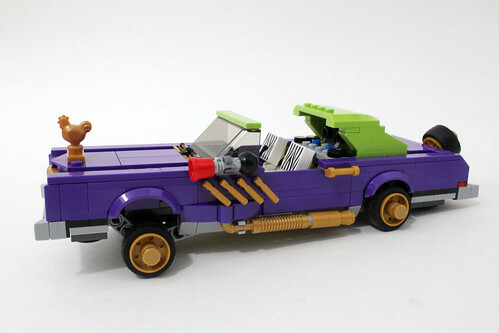 The overall look of the lowrider itself is really good. 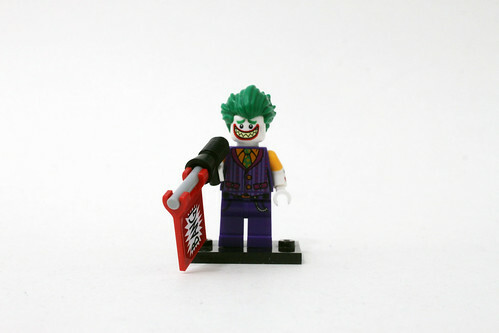 Add on the fact that we also have some exclusive minifigures in the set like the Joker and Harley Quinn which make fine additions as well.